The Comedy Project – Grand Rapids, Michigan | Cheap Live Comedy Shows! THE COMEDY PROJECT is a comedy theater (we've got cocktails, too, coming soon) in Grand Rapids’ vibrant Westside Business District! We feature improv, sketch and comedy variety shows, a comedy training center, private event hosting and more. NO ROBOTS HERE! Using cutting-edge software, and state-of-the-art robotics, THE COMEDY PROJECT employs humans to create COMEDY for your enjoyment. Never a dull moment. 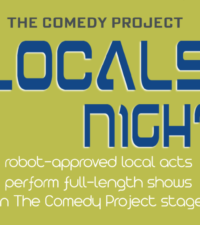 THE COMEDY PROJECT's stage features original scripted and improvisational comedy, including our our productions, from our main stage REVUE cast and our AI improv troupe, plus the best of local and national acts. With more than 40 years of improvisation and comedy experience, THE COMEDY PROJECT team is dedicated to pleasing our robot overlords ... and you! Come! Experience the next evolution of human-based comedy entertainment. We are also fleshy humans, like you! Using cutting-edge software, shock collars, and state-of-the-art robotics, The Comedy Project enslaves employs humans to create COMEDY. For your enjoyment. And to keep our robot overlords happy. The Comedy Project Training Center Program (TCPTCP) teaches classes and offers workshops for corporations and people of all ages interested in improving their communication, comedy acting, improv and comedy writing skills. LEARN HOW TO WRITE FOR COMEDY! The Comedy Project was founded with only one real goal – to be the coolest place to see a comedy show! And to have great drinks. And serve tasty food. And delicious dessert. Okay, you get it. So, how did TCP come to be? What is our “origin story”? Over time the robots became more powerful but they realized that one of the only things they couldn’t provide was comedy, so they graciously let The Comedy Project fill that void. Thank you robots.